Whether you're the CEO of a large corporation or the owner of a small business, employee Christmas gifts allow you to show your appreciation for all those who make your company successful. There are many gifts that your employees will enjoy. You really can't go wrong with cash, especially during the expensive holiday season. However, it lacks much of the finesse of a carefully-selected employee Christmas gift. Amazon.com is famous for books, but the online retailer also sells everything from pots and pans to exercise equipment. Many malls sell gift certificates redeemable at any store or restaurant in the mall. Local chambers of commerce sometimes offer gift certificates redeemable at participating businesses within the community. GiftCertificates.com offers a SuperCertificate, redeemable for a gift certificate from any participating merchant. A gift card from a retailer with an online presence can be helpful for those who don't want to make a special trip to the store to use their gift. Credit card gift cards from companies like Visa and American Express are another option. These gift cards are redeemable at any store accepting the credit card. They can even be personalized for corporate accounts. However, unlike store gift cards, credit card gift cards are likely to have a set-up fee. Food products are a popular choice for gift baskets. They can be simple with an assortment of fruits and nuts or lavish affairs with gourmet chocolates and wine. You may wish to have the gift baskets delivered directly to employees' homes because the logistics of storing and passing out dozens of baskets in the workplace can be tricky. 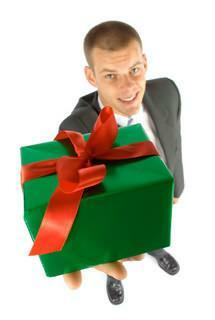 Large companies may wish to give the gift of corporate-branded merchandise. However, this isn't the time to pass out the cheap paperweights and pens. Look for functional yet classy items like polo shirts and leather portfolios. Depending on your business, you may be able to offer your employees a special discount for the holidays. For instance, if they normally receive 10% off their purchases, give them 25% off during a designated period. Some businesses may wish to plan a special event for employees instead of giving individual gifts. An elegant night of dinner and dancing can be a nice gift, or a family-oriented affair like a free afternoon movie screening is another option. If business allows it, treat your employees to an extra day or two of paid vacation time around the holidays. If you can't shut down the entire office, a voucher for extra vacation time in the next year will certainly be appreciated. Make sure you aren't in violation of any contract stipulations or union rules before using benefits like vacation time as a gift. Be sensitive to employees who don't celebrate Christmas. Although the use of the word "holiday" to describe Christmas has been the source of much debate lately, it is a culturally-sensitive way to express your seasonal greetings. You can also help by not making your employee Christmas gifts overtly Christian. Stay away from nativity scenes and advent wreaths. Even non-religious ornaments and decorations won't be of much use to people who don't celebrate Christmas. Keep gifts uniform. You may want to give different levels of employees different gifts, for instance buying larger gift cards for managers. However, if two employees do similar work, it will only cause hurt feelings if one of them gets a larger gift. Find other ways to reward employees who have been especially productive and helpful. Don't confuse an employee Christmas gift with an end-of-the-year bonus. A fruit basket says, "We're thinking of you during the holiday season." A separate cash bonus says, "Thanks for your hard work throughout the year." Even if you're not in charge of the entire business, consider getting gifts for the people who work under you. If you're a manager or supervisor, a Christmas gift can be a great way to show how much you appreciate your department.